In late October 2015 I stumbled across a drawing challenge issued by artist Jake Parker. It was "Inktober." A set of 31 drawing prompts that could be used by artists and budding artists and people who don't consider themselves artists at all to stretch their creative muscle. You look at the drawing prompts, you draw (ideally in ink, since it's "Inktober") and then you share it on social media with #Inktober. I liked the idea, but thought it was too late in the month to really participate. The next year, I was ready for #Inktober2016. Or...I thought I was. As is the case with many of these things, I was excited for the first week, and then ran out of time, and then got all perfectionist-y and not wanting to share what I was drawing. Here are three of mine, with the prompts "Noisy," "Collect," and "Sad." The challenge isn't meant to make us all perfect artists. It's to get us drawing. You won't become an artist if you don't draw. Much like the NaNoWriMo challenge (writing a novel in a month in the month of November), you won't become a writer if you don't write. I love the idea of the challenge, even if I need some help getting the challenge completed. Here are the prompts for #Inktober2018 -- the challenge has been issued. Not-Art-Teachers: First of all, you should be. I should be. Finding ways to bring art into the classroom is a great way to engage kids who aren't engaged with some of our other go-to tools. But if you're so hooked on your curriculum that the #Inktober list of prompts seems like it would be inappropriate for what you're doing, come up with a list of 31 prompts that are within your curriculum. Connect it to the Bill of Rights. States of Matter. Digestive System. I don't know. 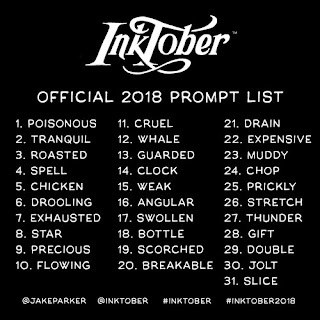 Maybe look at the #Inktober list for inspiration, and then find a side door from those prompts into your own content. If 31 days seems excessive, just do it for one week -- see what your students come up with. And, and-and, I can't overemphasize this: do it with them. Even if you don't feel like you're an artist, maybe especially if you don't feel like you're an artist. Show them your efforts, whether you feel like they're good or bad. You'll be connecting with kids who will get to see you in a whole new light. 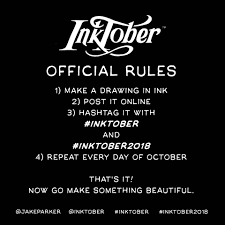 For more inspiration, check out the #Inktober2018 hashtag on Instagram and Twitter, and follow both Jake Parker and Inktober on Instagram. If you're on Twitter, more great follows are #K12ArtChat (both the hashtag and the account) and Laura Grundler and Matthew Grundler.